Scared about your job interview in the next few days? Meeting the monsters and witches of your industry, asking trick or treat questions at your job interview! 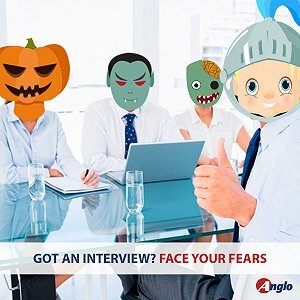 Don’t let the skeletons in your cupboard get the best of you and read our tips on how you can slay your demons to become the best monster killer at your job interview. Going into an unknown place with unemotional ghosts and dragons will intimidate you and play on your natural human instincts causing fear and an adrenaline rush. Be calm and composed knowing that you have all the weapons to overcome what they throw at you. Your energy is your first impression. Be confident that you will overcome their attacks. Ease them with your past experiences to show them that you are one of them. Let them know that you have newer weapons than them so they want you in the team. E.g. If the interviewers pull their poker faces, it may be a tactic to check how self-controlled, balanced or driven you are and to assess how you would cope under pressure. More interview tips on the top 10 interview blunders to avoid are available here. Know your enemy. Research, research, research vision, organisation, company and the role you are applying for. E.g. It often happens that we mysteriously forget the name(s) of whomever is interviewing us. You walk in, shake hands, smile, and promptly blank on your interviewer’s name. When you schedule the interview, ask for the names of anyone who’ll be interviewing you and repeat them a few times so you’ll remember who is who. You are the knight in shining armour. Build your confidence to convey your suitability. The brain at times can go on overload and needs a break; even computers crash so why not the complex human brain so move on. Don’t be afraid to get a deeper understanding of the question by asking relevant questions to the subject matter. (ref to Point 4.1) Also it can be helpful at times to try and engage conversation by asking questions to your interviewers about themselves such as: “What do you like best about working for this company?” Or “How did you get into the business?” These personal questions may help to get the interview back on track. Find yourself waffling as a zombie at any point means you need a break. Stop. Take deep breaths, recompose, take a sip of water then continue, making sure that the other zombies in front of you know that you have recomposed. First impressions count therefore be smart, show yourself off in your appearances and don’t be intimidated by the lack of efforts of the zombies looks. Have your costume tried, ready and pressed the night before. Yes. Don't let your recent weight-gain ruin your life even more… Imagine your clothes, without any warning or explanation, rip suddenly and you have to do the whole interview trying to hide the rip. Ladies, you want to look your best but don’t overdo the face painting. Getting the right outfit is a bit more complex, to say the least. You do need to make sure you look sophisticated without appearing like a lighthouse. You will need to do your hair in a modern way without looking too funky. Same story with nails, mind the colour. When doing your make-up you may want to apply a skin primer to avoid the shiny, slimy effect of a fish. Avoid tea and coffee; harms your nerves and devastating on your costume if spillages occur. Drinking tea or coffee before or during your interview is reserved to risk takers. A single drop on your shirt and you lose all your credibility. The same goes for business meetings and tomato-based food, not to name the most dreaded spaghetti Bolognese which literally jump on you like a baby alien coming straight from the movie. Days are short, beware of trips and falls during early and late interviews. Getting sprayed by a bus on the way to interview is everybody’s biggest nightmare so beware of the puddles! Surprise your interviewers with questions on the job role. Anglo has previously written an insightful article on exactly what questions you should ask at a job interview. Take your bag of personal treats. This point is mainly addressed to ladies. Make sure you bring your nail varnish, a second pair of tights, umbrella, flat shoes, a mirror and powder foundation for last minute touch ups. The ammo box. Have a separate file containing client and employee testimonials, research activities including publications in peer reviewed journals as well as sighting any authorships. Showcase your projects by presenting them in the form of a portfolio. You have not been called for an interview yet? You may want to read our article on how to make sure your CV gets noticed or the one on how to use social media to find a job.